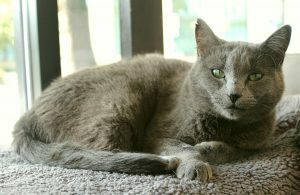 My name is Nermal, and I am a darling blue/gray female kitty with sparkling green eyes. I am about 5 years old and am very, very sweet. I got my name from the Garfield comics, since I’m a lot like the cute little gray kitten who is just so friendly! Although I am still pretty new to the shelter and I may be a little bashful at first, I don’t have a mean bone in my body and once someone starts petting me, I quickly relax and start purring. 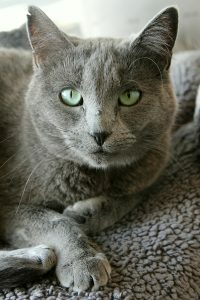 I have very soft, thick fur like a typical Russian Blue kitty, and I get along great with other cats. I would be a wonderful companion for another young kitty like myself and would do well with a family or with a single person — and anything in between! I’m very playful and adventurous, but probably don’t have much interest in going outside. I’d be a great apartment kitty and am very low-maintenance, so I think I’d be a purr-fect match just about anywhere! Are you missing a cat like me in your life? Come down to Pixie to meet me today! I come to you fixed, vaccinated, and micro-chipped for an adoption fee of $100.